LONGMONT, Colo., April 8, 2019 (GLOBE NEWSWIRE) -- 3D at Depth Inc., the world's leading expert in subsea LiDAR laser technology and 3D data solutions, announced today the success of an innovative underwater survey technique that integrates photogrammetry with Subsea laser LiDAR (SL) technology to create accurate, precise, reverse engineered 3D models. 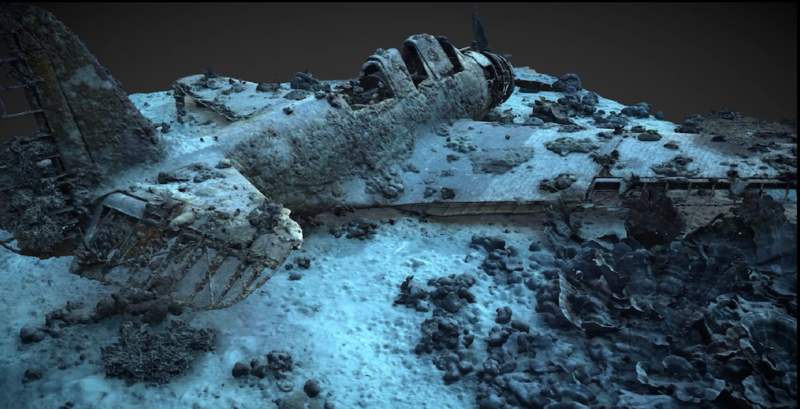 The technique was developed during an October 2018 expedition with the nonprofit Air/Sea Heritage Foundation to document the largely intact wreck of a rare and historically significant US Navy Douglas TBD-1 Devastator aircraft resting at the bottom of Jaluit Lagoon in the Republic of the Marshall Islands (RMI). Of the 129 Devastators built, all were either lost in battle, destroyed in operational accidents, or scrapped before the end of World War II. Part of the ongoing “Devastator Project,” this recent expedition was developed to capture precise, repeatable, millimetric data to build an accurate 3D model as a 21st century site map for this significant cultural heritage asset; and to serve as a “pre-disturbance survey” for the proposed recovery, conservation and public exhibition of the historic plane at the National Museum of the United States Navy in Washington, DC. This particular plane, US Navy Bureau of Aeronautics Number (BuNo) 1515, formerly assigned to Torpedo Squadron Five (VT-5) aboard the aircraft carrier USS Yorktown (CV-5) with the fuselage code "5-T-6" is located in a sensitive marine habitat. In order to conduct a safe, touchless, accurate survey, that would render a world-class 3D model, the expedition brought together a group of leading experts and volunteers utilizing the most advanced technology available. Under the leadership of Air/Sea Heritage Foundation co-founders, Russ Matthews, an accomplished historian and filmmaker and Dr. Peter Fix, a specialist in the field of materials conservation of watercraft and aircraft with the Conservation Research Laboratory and Center for Maritime Archaeology and Conservation (CMAC) at Texas A&M University, the Devastator Project team consisted of Brett Seymour, a top-flight underwater photographer on loan from the National Park Service's Submerged Resources Center; Evan Kovacs, an innovative engineer and experienced technical diver who runs Marine Imaging Technologies; Matt Christie, Senior Subsea LiDAR Specialist with 3D at Depth; Brian Kirk, an expert local guide and original co-discoverer (with historian/explorer Matt Holly) of the wreck of BuNo 1515; plus archaeologist/divers Chris Dostal, Carolyn Kennedy, and Michael Terlep. Advisors from the Advanced Imaging and Visualization Laboratory at world-renowned Woods Hole Oceanographic Institute were also part of the expedition planning and post-production stages. Although Devastator 1515 appeared largely intact from previous research expeditions, the sensitive nature of the wreck and often low water clarity conditions around the site provided limitations for most of the standard data collection processes and other optical imagery collection methods. In addition, as a pre-disturbance survey, it was important to capture not only the repeatable, accurate, millimetric details of the aircraft but also the substance and structures of the marine biomass on and around the aircraft. These challenges created a unique opportunity for 3D at Depth’s SL3 subsea laser LiDAR with its powerful real-time 3D data processing unit. In addition, the team used still photography, 4K video, 3D photogrammetry, and 360 ⁰ VR. Over a period of six days on site, dozens of dives were conducted to the wreck located under 130 ft of water. Four registration markers were set in pre-approved areas to check accuracy for both laser scans and photogrammetry technology. 3D at Depth’s SL3 laser was deployed at varying ranges from the wreck site while maintaining a safe distance, so as not to disturb the surrounding area. The steerable beam allowed for flexibility and accuracy while working alongside other technology applications. The SL3 pulsed at 40,000 measurements/sec for each scan position acquiring very high-density sector scans. 3D at Depth’s patented index of refraction correction algorithm was able to deliver repeatable data sets in low clarity water quality where other optical solutions would struggle to operate. In total, the SL3 LiDAR laser delivered a total of 92 million points and the photogrammetric data after processing produced 5.7 million vertices. Each dense point cloud was then surface modeled and moved into a 3D design computer. Optical imagery from photogrammetry, 360 VR and stills were integrated into the designs to render an exact 3D model of the Devastator. Along with the laser LiDAR data, the team captured 1,398 still images with photogrammetry. 3D at Depth will be showcasing their SL3 technology, 3D Data Services and Subsea Survey Support Solutions during Ocean Business 19 in Southampton, United Kingdom from April 9-11th. Please visit Booth D10 for more information. NOTE: The Devastator Project expedition was conducted under a Special Use Permit granted by the Underwater Archaeology Branch of the US Navy History & Heritage Command. The team worked in close coordination with the RMI Historic Preservation Office and were accompanied in the field by Susan Underbrink, an archaeologist with the Ministry of Culture and Internal Affairs and consulted regularly with the local Jaluit government and the Atoll’s traditional leadership.